Some numbers for you. When Bayern Munich and Borussia Dortmund meet in the Champions League Final on May 25th, this will be the first all-German one-off European Final; the first all-German European encounter since Werder Bremen met Hamburg in the 2009 Europa League; the second meeting in Europe of this year’s finalists; the second all-German European Final; the sixth German opponent Bayern has faced in Europe and the seventeenth all-German meeting in the history of European club competition. 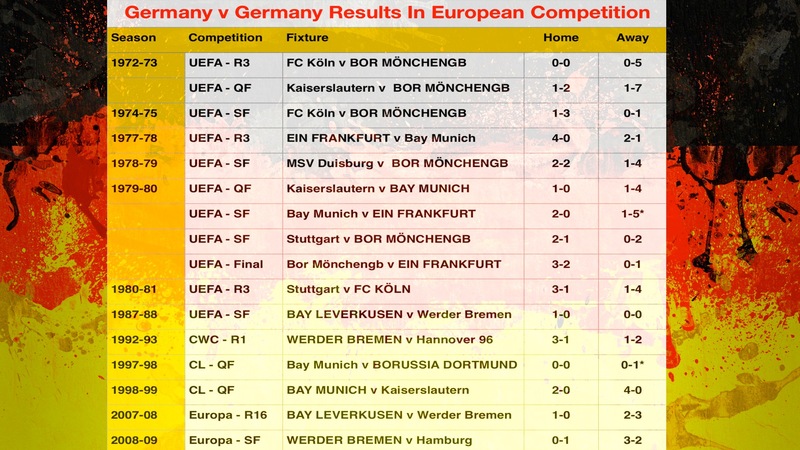 In the first of a regular series called Versus, we’ve compiled all Germany v Germany results from the dozen Bundesliga teams who have met in European competition since 1972, excluding teams from the former GDR. The aim was to see which team has the best inter-German record – the Bundesliga’s internenmeister if you like. It’s one of those rare tables that Bayern Munich doesn’t top and aside from Dortmund who have not played enough games to be representative, Borussia Mönchengladbach are the undisputed top dogs. A special mention for Eintracht Frankfurt who are the only German side to have won all their inter-German ties. Here are the historic results from the all-German European ties. * denotes after extra-time.